Celebrating Valentine’s Day is always a good way to break up the doldrums of a grey winter. Valentine’s Day Weekend has arrived so here are a few suggestions on how to celebrate the occasion with your sweetheart. There are several special events in the area that have become cherished traditional events in this area. 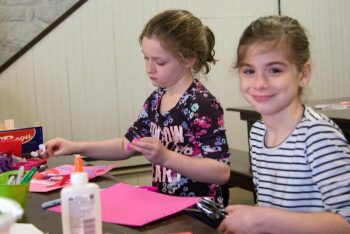 On February 9 from 11 a.m.-4 p.m., Hagley Museum and Library (Route 141, Wilmington, Delaware, 302-658-2400, www.hagley.org) will host its 2019 edition of “Victorine’s Valentine Day”. Victorine’s party will be held at Blacksmith Hill, the restored 19th-century workers’ community where the lives of the du Ponts and the people who worked for their company connected. Here lived a woman named Victorine du Pont Bauduy (1792-1861), the eldest daughter of the DuPont Company founder. During Victorine’s Valentine Day, “Victorine” will tell her story, as well as other love stories from the 19th century. Victorine was the daughter of E. I. du Pont, who built the mills on the Brandywine. She fell in love with Ferdinand Bauduy, the son of E. I.’s business partner. E. I. opposed the marriage, believing the couple was too young to be married. Ferdinand moved to France for two years, during which time Victorine pined for him. After two years, E. I. relented, and the young couple joyfully married in 1813. Tragically, 11 weeks after their marriage, Bauduy became ill and passed away. Victorine was heartbroken, but after a long period of grief, she found a new passion in her life. Victorine threw herself into teaching at the Brandywine Manufacturers’ Sunday School. She remained the superintendent until her death in 1861. In addition to the telling of Victorine’s story, the event will feature other activities such as making a Victorian Valentine. 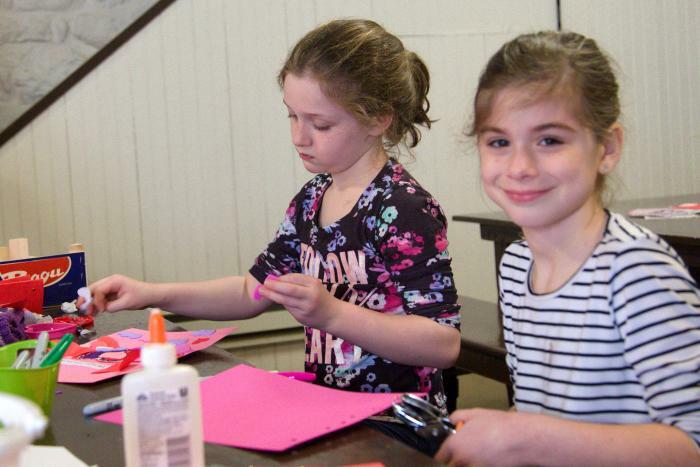 In the Brandywine Manufacturers’ Sunday School, visitors can experience what school was like in the nineteenth century. A special exhibit featuring antique Valentine cards and chocolate-themed treasures from Hagley’s collection will be on display. All activities, including designing a candy bar wrapper and snacking on hot chocolate are included. Visitors will be able to check out Hagley’s current exhibits, explore demonstrations in the Powder Yard, tour the du Pont ancestral home, and enjoy walks along the scenic riverside. The best place to start a day at Hagley is at the visitor center. Exhibits and dioramas document the Brandywine Valley’s early eras as well as the history of the DuPont Company. During the Civil War, the DuPont Company produced almost half of the gunpowder purchased for use by the Union army. Visitors who go outside can walk along the Brandywine to see how water power was used to run the mills. Stops along the walk include a line shaft, a dam, a mill race and a restored 19th-century machine shop. Guests can also learn how gunpowder was tested using a device called an eprouvette. Admission to Hagley Museum is $15 for adults, $11 for seniors and $6 for children (ages 6-14). Victorine’s Valentine activities are included with regular admission. 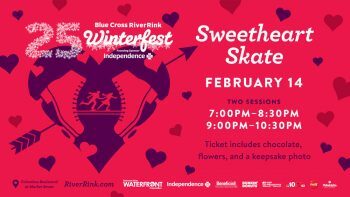 If you’re looking for another out-of-the-ordinary way to celebrate Valentine’s Day, you might want to consider taking part in the “Sweetheart Skate” at the Blue Cross RiverRink (Market Street at the Delaware River, Philadelphia, 215-923-6533, www.riverrink.com). “Sweetheart Skate” is slated for February 14 at the outdoor rink with two skating sessions — 7-8:30 p.m. and 9-10:30 p.m. The event’s focus is providing a suitable atmosphere for guests to skate with their special someone and RiverRink features one of the most romantic settings in the city. Tickets, which are $25, include chocolates, flowers, photo booth, and a DJ taking your special requests. Food, beer, and specialty cocktails can be purchased on-site from Garces, Chickie’s and Pete’s, and Franklin Fountain. A deejay will host the evening and serve up a menu of music that will allow guests to skate to their favorite love songs with their significant others. As an added attraction, there will be a variety of special games and opportunities to win prizes. RiverRink has another special activity on its schedule for this week. On February 9, the rink will host “Sweets & Stouts,” a mid-afternoon sweet treat including tasty sweet and drink samples. The event, which runs from 2-6 p.m., will feature food samples from Dunkin Donuts, Garces Group, Chickie’s & Pete’s, and Skelly’s Amusement, and drink samples from Moscow Effen Mule, Kentucky Makers Mule, Conshohocken Brewing Company, Fordham and Dominion Brewing, Twin Lakes Brewing Company, and Troegs Brewing Company. Entry into the event is free and samples are available to enjoy as you wish. Alcohol samples available for those 21 and older. Samples are limited and available while supplies last. “Sweets & Stouts” will also feature screenings of “Charlie and the Chocolate Factory” (2005) and “Willy Wonka & the Chocolate Factory” (1971). Valentine’s Day and chocolates have been a match made in heaven for a long time. Not surprisingly, Valentine’s Day is in the top four for holiday candy sales. If you’re wondering how the top four stack up against each other, you might be surprised at the answer. Easter is first with Christmas not far behind. Valentine’s Day is back a little in third with Halloween a close fourth. Valentine’s Day is just a few days away and wine-loving chocoholics have been – and will be — celebrating all month. The Chaddsford Winery (632 Baltimore Pike, Chadds Ford, 610-388-6221, http://www.chaddsford.com) is hosting Wine & Chocolate Pairings every Saturday and Sunday in February from 1-5 p.m. and Valentine’s Day (February 14) from noon-7 p.m. The event features a walking wine-and-chocolate tour of Chaddsford Winery. Visitors can explore several areas of the historic property as they visit five stations featuring artisan chocolates carefully paired with the winery’s award-winning wines. The “Wine & Chocolate Pairing” line-up, which features gourmet chocolates by Éclat Chocolate and Gemelli Gelato, includes Passion Fruit Chocolate with 2017 Presage, Star Anise Chocolate with 2016 Artisan Series Traminette, Aleppo Chili Chocolate with Sunset Blush, 73% Dark Chocolate with The Red Standard and Gemelli’s Single-Origin Dark Chocolate Gelato infused with Chaddsford Red. The “Wine and Chocolate Pairings” at Penns Wood Winery (124 Beaver Valley Road, Chadds Ford, 610-459-0808, http://www.pennswoodsevents.com) are being held every Saturday and Sunday in February from 11 a.m.-5 p.m. as well as on Valentine’s Day (February 14) from 1-7 p.m. In addition to its regular tastings, the winery is offering special tastings to celebrate February because February is the month of wine, chocolate, romance and fun. Penns Wood is adding new and exciting items to its wine and chocolate pairings this year featuring four of its wines and one beer selection carefully paired with local chocolate treats. Some of the featured wines will be Chardonnay Reserve, Chambourcin, Traminett and Penns Woods Gruner Veltliner. Tickets cost $25 per person in advance and reservations are required. Cancellations must be made within 72 hours or ticket holders will be charged the full amount of the tasting. Reservations are made and kept on the hour. Kreuz Creek Vineyards (553 South Guernsey Road, West Grove, 610-869-4412, www.kreutzcreekvineyards.com) will present “Valentine in the Vineyard” on February 16. On this special Saturday, visitors can enjoy chocolate fondue made with Bevan’s dark chocolate and the winery’s Ruby “K” Port. There will be live music performances from 2-5 p.m.
“Valentine in the Vineyard” is a sweet event for sweethearts made even sweeter by free admission. Black Walnut Winery (3000 Lincoln Highway, Sadsburyville, 610-857-5566, www.blackwalnutwinery.com) will have “February Wine and Chocolate Pairings” on February 9, 10, 16, 17, 23 and 24. The special days will feature a pairing of five of Black Walnut’s wines with gourmet chocolates from Bridge Street Chocolates of Phoenixville. Wine and Chocolate pairings will take place at the top of hour at 1, 2, 3 and 4 p.m. The sessions will also be held same dates and same times at the winery’s location in Phoenixville at 260 Bridge Street. Cost is $25 per person and includes a Black Walnut logo wine glass. Guests can choose to upgrade their pairing to include a Port tasting as well (two port style wines) for $30 per person. 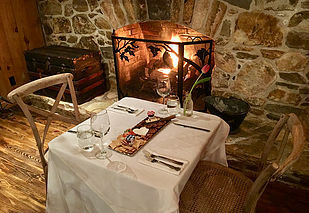 The evening includes a romantic dinner for two at Galer Estate Vineyard and Winery featuring gourmet food. Each course will be paired with Galer Estate wines — including an exclusive tasting of the Double Gold Cabernet Franc. There will be one seating at 7 p.m. in the Red Lion Tasting Room with tickets priced at $125 per person. The menu features Miniature Artisan Cheese Plate, Baby Crabcake Hors d’oeuvre, Lemon-Chive Remoulade Honey Cornbread paired with Sparkling Chardonnay; Petite Arugula Salad, Apples, Cheddar & Maple Vinaigrette paired with Grüner Veltliner; Braised Short Rib with Kennett Mushroom Sauce and Rosemary Roasted Potatoes paired with Cabernet Franc; Chocolate Glazed Crème Brûlée Cream Puffs & Raspberry Rose Macarons paired with Huntress Red. The Berks County Wine Trail (www.berkscountywinetrail.com) will present “Chocolate & Wine Pairing Event Weekends” to celebrate Valentine’s Day. The event is scheduled for February 9, 10, 16 and 17 from noon-5 p.m. each day. Visitors can toast Valentines’ Day during two sweet weekends on the wine trail sampling sumptuous chocolates and confections paired with featured wines of the region. They can visit each of the 10 participating wineries along the Berks County Wine Trail to determine their favorite pairing combo. Stone Barn Cellars (Spring City) Love is in the air with an oh-so decadent chocolate mousse creation paired with Morning Glory white wine. Deerfoot Winery (Shoemakersville) will offer whimsical chocolate and vanilla cake balls with pairings of two of this winery’s wines — Six Point, a red wine and Comfy Couch, a white wine. Long Trout Winery (Auburn) features chocolate wines paired with homemade chocolatey cakes and confections. Weathered Vineyards (New Tripoli) is featuring brownies infused with Merlot and a drizzled grenache topping. Ridgewood Winery (Birdsboro) offers Underground, a semi-sweet blackberry and Merlot wine blend, paired with chocolate cordials filled with peanut butter and Underground wine. Manatawny Creek Winery (Douglassville) will be doing chocolate cheesecake with blueberry wine reduction paired with Happiness, a blueberry grape blend wine. Kog Hill Winery (Morgantown) offers a red pairing of Chocolate Torte paired with Strawberry Harvest Wine, and a white pairing of mint-chocolate with Gewertztraminer. Calvaresi Winery (Bernville) presents Chocolate Merlot Mini Cupcakes and Ultimate Malted Milk Balls alongside Autumn Rose. Setter Ridge Vineyards will have a mini chocolate cupcake topped with a Pinot Gris buttercream frosting and served with their Pinot Gris wine. Stoudt’s Winery (Shartlesville) will be pairing Strawberry wine with chocolate covered strawberries. A great way for chocoholics to satisfy their chocolate cravings is to take a trip to Hershey during the month of February. This month, it’s time for “Chocolate-Covered February in Hershey” (various locations around Hershey, 800-HERSHEY, www.chocolatecoveredfebruary.com). It is only natural that Hershey, the town that bills itself as “The Sweetest Place on Earth,” hosts a month-long celebration in honor of all things chocolate. Hershey has decadent chocolate events planned throughout the month of February. This weekend, visitors to the Hershey Store can try their hand at making their own heart-shaped milk chocolate confections and hand-made truffles. Other activities are a “Chocolate Tea” at the Hotel Hershey and a “Chocolate and Spirits Pairing Class & Chef Demonstration” at the Hershey Lodge. The “Hersheypark Chocolate Parade” will be held at the amusement park every Saturday and Sunday in February beginning at 2:30 p.m. each day. There will also be an “Interactive Story Time & Hot Cocoa” session at 1 p.m. and again at 3 p.m. at Hersheypark every Saturday and Sunday in February. Other activities throughout the month include “Chef Demonstrations” at the Hotel Hershey, “Hershey’s Chocolate Dessert Journey” at Hershey’s Chocolate World, “Hershey’s Character Breakfast” at Hershey Lodge, “Wild Treats” at ZooAmerica, and “Old Chocolate Balsamic Tastings” at the Hotel Hershey. Chocolate will make an appearance this weekend at The Uptown! Knauer Performing Arts Center (236 North High Street, West Chester, https://uptownwestchester.org/). On February 10, will host “Chanting & Chocolate in Chester County” from 3-5 p.m. with another session slated for 7-9 p.m.
“Chanting and Chocolate in Chester County,” is a program sponsored by the Lasko Family Foundation. It has a simple formula. Using old and new melodies, participants will chant together — and then have chocolate. Music is known as the universal language. Participants will chant wordless melodies together — for the pleasure of being together and creating sound in community. 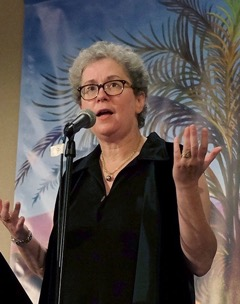 Facilitated by Rabbi Elyse Seidner-Joseph, “Chanting and Chocolate in Chester County” is open to everyone. There will be no religious teaching or prayer. People of all faiths or of no faith or of multiple faiths are welcome. A free-will offering to support local charities is requested, not required. A different charitable organization will be sponsored each month. Other upcoming activities at The Uptown! Knauer Performing Arts Center are a concert featuring Curtis On Tour Vocal Quartet on February 9 at 7 p.m. and Dueling Pianos on February 14 at 7:30 p.m. The temperature in Chester County this Saturday afternoon is forecast to be just a few degrees above freezing – 35 degrees. That is not very good news for the hardy souls participating in a special charity event on February 9 – the 2019 Polar Plunge. 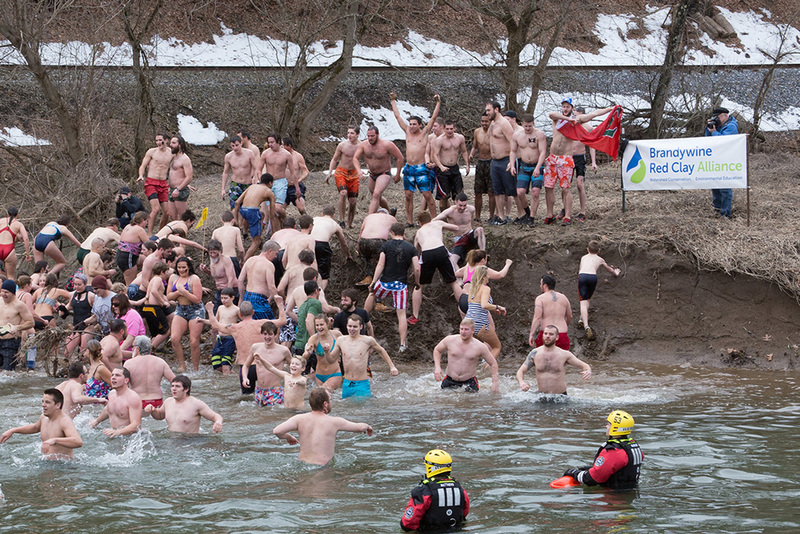 Sponsored by the Brandywine Red Clay Alliance (http://www.brandywineredclay.org), the 11th annual staging of the Plunge will take place from 10 a.m.-1 p.m. at Brandywine Picnic Park (690 South Creek Road, West Chester). After the Plunge, hot chocolate and coffee will be available and a grill will be fired up to provide burgers, hot dogs and fries. Chili and veggie burgers will also be available. The attire is swimsuits only – no t-shirts, flip flops or wet suits. No diving or entering the water head first will be permitted. And, the BRC Polar Plunge will be held rain, snow or shine. Dress warmly. Usually, winter weather in this area is not very conducive for outdoor events — except maybe activities for skiers, skaters, snowboarders and people who enjoy really cold outdoor temperatures (like Polar Plunge participants). However, this weekend might be an exception to the rule and that’s a good thing for area art lovers. Now through February 9, the Chadds Ford Historical Society is hosting its 11th Annual Winter Plein Air Event at its Barn Visitors Center (1736 Creek Road, Chadds Ford, 610-388-7376,www.chaddsfordhistory.org). If you’re wondering why the weather is a factor in the presentation of an art show it’s because this weekend’s event is not just another art show — it is a plein air event. “En plein air” is a French expression which means “in the open air.” It is mainly employed to describe the act of painting outdoors, which is also called “peinture sur le motif” (“painting on the ground”) in French. This weekend, a select group of artists will be creating works of art “en plein air.” Artists from the Mid-Atlantic region will be painting around the Chadds Ford area as well as at the Barns Brinton House, John Chads House and along Brandywine Creek. “Paint Out Chadds Ford” celebrates local art and artists and harkens back into time when early American illustrators and painters such as Frank Schoonover, Howard Pyle, Bayard Berndt, and N.C. Wyeth were inspired by the beauty of our region and painted outdoors. After a session of painting in Chadds Ford and the Brandywine Valley, the participating artists will return to the Chadds Ford Historical Society’s Barn Visitor Center on Saturday to frame and hang their paintings for a special exhibit and art sale. The Chadds Ford Historical Society will host a special art exhibition at the Society’s Barn Visitors Center from 6-8 p.m. Visitors are invited to attend the exclusive “En Plein Air Preview Party” for a first look at the wet paintings while light refreshments with the artists. Artists participating in “2019 Paint Out: Chadds Ford” are Bruno Baran, Alison Barry, Jacalyn Beam, George Bodine, Thomas Bucci, Stephen Burke, Joe Cairone, Valerie Craig, Ann Crostic, David Diaz, George Gallatig, Liz Griesser, Debra Howard, Judith McCabe , arvis, Kirk Larsen, Megan Lawlor, Carol Mangano, Kirk Mcbride, Alison Menke, Yvonne Mucci, Elise Phillips, Crista Pisano, Jane Ramsey, J. Stacy Rogers, Brian J Stoj, Annie Strack, Susan Styer, and Stewart White. Guests can meet the artists, and view the work just completed in the Paint Out Chadds Ford plein air event as well as select art featuring the Brandywine Valley. All exhibited artwork is available for purchase. A portion of the proceeds from each painting sold helps support the Chadds Ford Historical Society. Admission is $10 per person for the Artists Reception. The event, which runs from noon Saturday until 2 a.m., will feature more than 10 live bands and DJs along with 10 themed rooms. It will also host a giant outdoor ice bar, food court, a giant Arctic luge, photo booth, custom heated tents, three giant ballrooms, beer pong and baggo tournaments, giveaways, local and national celebrity guests and interesting drink specials. The headline acts are High Five Swan Dive and Old News Band. The massive winter celebration will also feature with a variety of the area’s best DJ’s. The Old News Band, HaHa Charade and Elena Brokus Productions Future Stars will headline the police fundraiser starting at 4 p.m. inside the Heritage Ballrooms with proceeds going to Vest-A-Cop, Delaware County Law Enforcement Memorial Fund and the Trauma Survivors Foundation. Tickets are $14.99 at the gate. The General Warren Inne (9 Old Lancaster Road, Malvern, 610-296-3637, www.generalwarren.com) is an historic site — a site with a lot of history and a site that is still involved in history of the area. Now, the General Warren Inne annually presents a series of lectures about America’s war for independence. On the second Monday of each month now through May, the Inne will host “Paoli Battlefield Lecture Series” presented by the Paoli Battlefield Preservation Fund. On February 11, the program will be “George Washington: First Entrepreneur: How George Washington Built His – and the Nation’s – Prosperity” presented by Ed Lengel. Lengel, the former Chief Historian of the White House Historical Association, will talk about Washington’s extensive but often overlooked financial papers chronicling the fascinating and inspiring story of how this self-educated man built the Mount Vernon estate into a vast multilayered enterprise and prudently managed meager resources to win the war of independence. You can also get a look back at history on February 10 when Bellevue State Park presents a special event called the Cauffiel House Tour (720 Carr Road, Wilmington, Delaware, 302-761-6952,http://www.destateparks.com). Park guides will discuss the history of this lesser-known historical site in Bellevue State Park – from the house’s construction through its purchase by the Division of Parks and Recreation in 1993. Once the home of Daniel Cauffiel, advisor to the duPont family, the Cauffiel House was built in the early 1920s in the Colonial Revival-style. Influenced by his frequent travels to Europe, Cauffiel decorated the estate with unique furnishings from the 1930s, some of which remain. 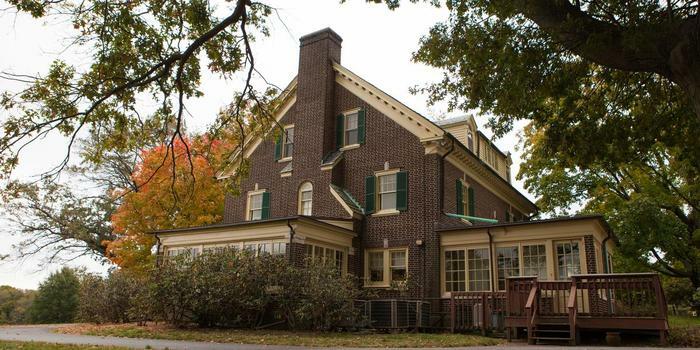 The Cauffiel family used the home as a summer residence, and two of his children lived at the house into the 1990s. The State of Delaware acquired the property in June 1993. The house tour will highlight measures taken to make this a simple yet elegant place to live. The tour will begin at 1 p.m. with tickets priced at $6 per person. Another Delaware State park is presenting a special event on February 10. White Clay Creek State Park (76 Polly Drummond Hill Road, Newark, Delaware) is hosting a “Valentine’s Tea and Tour at the Judge Morris Estate” from 2-3:30 p.m. Visitors can join the park staff for a lovely Valentine’s tea and tour of the Judge Morris Estate. Afternoon refreshments and tea will be served. Tickets are $16 per person. Visitors can call 302-368-6900 to register. Delaware is also the place to go this weekend for some Chinese New Year events. The Chinese (or Lunar) New Year has arrived. The Chinese zodiac is a rotating cycle of 12 years in which each year is represented by a specific animal and its characteristics — rat, ox, tiger, rabbit, dragon, snake, horse, sheep, monkey, rooster, dog and pig. 2019 is the “Year of the Pig” according to Chinese zodiac. The Pig occupies the last (12th) position in the Chinese Zodiac. You are a “Pig Chinese Zodiac native” if you are born in one of these years: 1935, 1947, 1959, 1971, 1983, 1995, 2007, 2019. A pig represents luck, overall good fortune, wealth, honesty, general prosperity, symbolizing a hardworking, a peace-loving person, a truthful, generous, indulgent, patient, reliable, trusting, sincere, giving, sociable person with a large sense of humor and understanding. According to the Chinese astrology, 2019 is a great year to make money, and a good year to invest. 2019 is going to be full of joy, a year of friendship and love for all the zodiac signs — an auspicious year because the Pig attracts success in all the spheres of life. On February 10, the Delaware Art Museum is hosting “Chinese New Year Celebration: Year of the Pig” from 11 a.m.-3 p.m. This popular family program includes traditional Chinese art, activities and demonstrations with a special presentation by the Renaissance Chinese Opera Society. The Chinese American Community Center Folk and Lion Dance Troupes and Yo-Yo Club will perform. This program is co-presented with the Hanlin Chinese Culture Association. The schedule of activities is: 11 a.m., Chinese New Year inspired art activities and “Drop in Art Making” with Contemporary Artist Willie Yao; 11:30 a.m., Lion and Folk Dances by Chinese American Community Center; noon, Chinese Calligraphy and Dough Figuring; 1:30 p.m., Demonstration by the CACC Yo-Yo Club followed by Performance by the Renaissance Chinese Opera Society; 2 p.m., Chinese Calligraphy and Dough Figuring. The family-friendly event features free admission. There will be another Lunar New Year event in Delaware this weekend. The Delaware Chinese New Year Celebration, which is presented by the Delaware Chinese American Association (dcaadelaware.org), will be held on February 9 at 1:30 p.m. at Dickinson High School (1801 Milltown Road, Wilmington, Delaware). The free event, which is open to the public, will feature Chinese vocal and performing arts, Chinese opera and Asian variety shows. There will also be an impressive exhibit of Chinese artifacts, door prizes and Chinese snacks. On February 9, visitors are invited to celebrate the Lunar New Year at Delaware Contemporary (200 South Madison Street, Wilmington, Delaware, 302-656-6466, https://www.decontemporary.org/china-pop). “China Pop: Contemporary Year of the Pig” is scheduled for February 9 from 7-9 p.m. Visitors are invited to join in on a modern take on a cultural celebration inspired by contemporary Chinese art – and to come dressed in a splash of red for good fortune and enjoy activities to bring peace and prosperity in the New Lunar Year. This event will feature a silent art auction offering a unique art collectors’ opportunity to acquire contemporary Chinese art. Participating artists include Zhihui Xie, ceramic sculpture artist based in Philadelphia; Jun Cen, an illustrator for world class press; Liu Chang, a mixed-media artist; Qingshan Wang, photographer who explores the interactions between nature and human beings in urban ecosystems; Chunmei Jia, ceramic artist who studies the topic of materiality in contemporary art; Chenxi Huang, functional designer; and Chenlin Cai, painter using the time-honored craft of inside-bottle painting, cellular structure oil painting texture, and X-ray image to interpret landscape. Other attractions at the event will be a balloon drop-and-pop to ward off the bad luck, DJ Skinny White spinning his signature disco house and funky breaks mixed with Chinese pop music interludes, a cash bar, and tasty food including fish tacos, crab cake sliders, and dumplings. From February 8-10, the Greater Philadelphia Expo Center (100 Station Avenue, Oaks, 484-754-3976, www.phillyexpocenter.com) is hosting the Americana Indian Art & Jewelry Show. American Indian art is always a popular motif for home decorating is American Indian art — especially artwork produced in the American Southwest. This weekend, you can find a lot of examples of this art style at the Americana Indian Art & Jewelry Show on Oaks. The show provides an excellent opportunity to look at artifacts and other items related to the history of Native Americans. The show is presented by the Americana Indian and Western Gallery and admission is free. The Americana Indian and Western Gallery had its beginning in 1947 when its founder Lee Anderson attended school on a Navajo reservation and worked after school for his uncle in the trading post. The family collected American Indian art such as Navajo rugs, pottery, baskets, and other Indian and western items. Anderson’s sells Navajo, Hopi, Zuni, and Santo Domingo jewelry, as well as Navajo rugs, Hopi and Zuni kachinas, baskets, pottery, art and collectibles. One of the most respected Native American art dealers in the United States, Americana Indian Shows brings thousands of items direct from the Southwest to the show attendees. 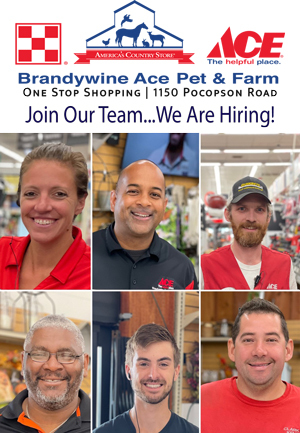 Show hours are 11 a.m.-8 p.m. on February 8 and 11 a.m.-7 p.m. on February 9 and 10. On February 8, the Garden State Discovery Museum (2040 Springdale Road, Cherry Hill, New Jersey, 856-424-1233, www.discoverymuseum.com) is hosting its fifth annual mid-winter ball. In previous years, it was known as the museum’s “Frosty Ball” and featured the museum’s cast of “Frozen” characters. Participants are encouraged to put on their PJs and their thinking caps and then get ready to solve a mini mystery with their favorite masked friends. Kids can look for clues around the museum and catch the villain. Then, they can dance the night away in their PJs. Ice cream will be provided by Silver Diner. Tickets for the ball are $30 for children and $5 for adults. Offering visitors a respite from winter each year in February and March, Longwood Gardens (Route 1, Kennett Square, 610-388-1000, www.longwoodgardens.org) celebrates the one of the world’s most popular plants – the orchid. At the beginning of every year, Longwood Gardens turns its focus to the ultra-popular plant during “Orchid Extravaganza” — an annual event that is running through March 24. If you want to visit the 2019 Philadelphia International Auto Show, you only have a few days left. The 2019 edition of the popular show at the Pennsylvania Convention Center (1101 Arch Street, Philadelphia, 610 279-5229, www.phillyautoshow.com) opened on February 2 and will close on February 10. The Philly Auto Show, which is one of the premier auto shows in the nation, continually grows and improves with new attractions every year. The 2019 show will be the biggest yet with more than 700 vehicles — and more than 40 brands — on display under one roof. This year’s 118th annual staging of the event features a 700,000-square foot display floor with a wide array of pre-production, production, exotic, classic, and concept cars. 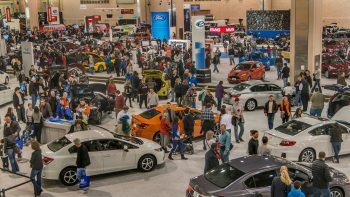 As one of the largest auto shows in the nation, the Philadelphia Auto Show annually welcomes approximately 250,000 attendees during its nine-day run. The Philadelphia Auto Show is a showcase for the newest batch of models to capture the public’s eye including Lamborghini Aventador, McLaren 570S Spider, Aston Martin DB 11, Karma Revero, Bentley Bentayga, and Maserati Quattroporte. 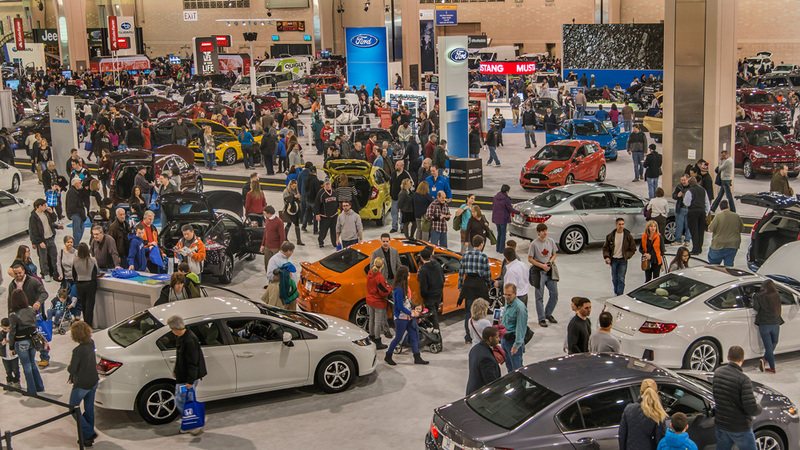 The 2019 Philadelphia Auto Show hours are noon-10 p.m. on Friday, 9 a.m.-10 p.m. on Saturday, and 9 a.m.-6 p.m. on Sunday. Tickets are $14 for adults (age 13 and up), $11 for active military, $7 for seniors and children (ages 7-12). Children age 6 and younger do not require a ticket. February is African American History Month and the National Constitution Center National Constitution Center (525 Arch Street, Independence Mall, Philadelphia, 215-409-6700,www.constitutioncenter.org) is honoring it with a number of special events and attractions that are running now through the end of February. Activities at the Center will feature interactive programming designed for visitors of all ages. There will be artifacts highlighting important moments in African American history including a rare printing of the Emancipation Proclamation which was signed by President Abraham Lincoln. Visitors are able to take a closer look at the museum’s rare printing of the Emancipation Proclamation to learn more about its history, the history of the Civil War, and the background of the 13th, 14th, and 15th Amendments. The “Breaking Barriers Show” looks at the lives of Thurgood Marshall, Bessie Coleman, Jackie Robinson, and other extraordinary African Americans throughout history to provide insight into the issues they faced and the rights they secured for all Americans. On the “Self-Guided African American History Tour”, visitors can tour the Center’s main exhibition “The Story of We the People” and discover important moments in African American history through historical artifacts. Some of the featured attractions on the tour are rare, signed copies of the Thirteenth Amendments and Emancipation Proclamation, President Obama inauguration artifacts, The American National Tree (featuring influential African Americans including Paul Robeson, Fannie Lou Hamer, Ward Connerly and Muhammad Ali) and an original printing of the Supreme Court’s controversial Dred Scott decision. As part of the museum’s interactive daily programming in February, visitors can test their knowledge of African American history at the museum’s “Giant Game Board.” Children and families compete to see who can cross the finish line first. Participants serve as game pieces as they roll the giant dice, answer questions and work their way across the board. As an added attraction, the Center is offering a special “Winter Sale” on admission. Now through March 31, tickets are only $10 for adults and $7.50 for children.